No car and no booking worries...relax and chill out ! Everything is taken care of ! b) When you come and stay at one or more of our self-catering flats, we can provide you with extra services, such as: 1) a hot meal with us on your arrival day (dinner), 2) cooking classes for two to max 4 people on the spot. 3) A tour of Florence can be arranged and/or wine and cultural tour in the Chianti, Brunello, Montepulciano or other areas of Tuscany. c) Anna, Julian's wife, produces delicious preserves, marmalades and chutneys from our own organically grown fruit. d) Julian has been producing his own extra virgin olive oil using natural methods of cultivation (there has been no use of pesticides and chemical fertilizers) since 1985.
e) Julian also posesses a professional drivers licence and works with tour agencies with all sorts of limousine cars... You can choose from a variety of FASCINATING tailor made cultural wine tours..! (English mother tongue and deep (over 35 years) direct wine and olive oil farming experience ). f) Julian's sister is an official professional tour guide of Florence in English, Italian, French, German and Spanish. She has deep a knowledge of the history of Florence, the Renaissance, history of art in general and literature. We can provide you with a complete, quite reasonable , A to Z arrangement. We look forward to any suggestions and comments....! Get in touch and we can work out the most suited and convenient holiday for you ! 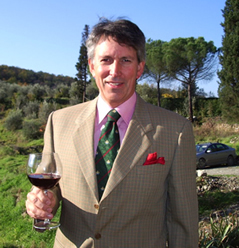 I started to explore and share my time, in areas, where excellent Chianti and Brunello wines are being produced, with enthusiasts like myself many years ago…! I now organize daily tours to small prestigious wine farms. My deep knowledge in wine (and olive oil production), due to the long experience accumulated in almost 20 years, plus a special professional driving licence (NCC), enables me to cover short and long distances, in the whole Tuscan area (and other regions of Italy). According to customer preferences, I can prepare special tailor-made blends of culture + wine tours. 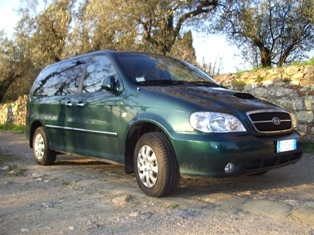 On request, I can be hired full time for touring Italy or going abroad with any comfortable, available car, in that moment, and accompany my clients with discretion and punctuality, organizing every detail of the trip.